The affect of antibiotics in patients with kidney cancer who receive immune checkpoint inhibitors remains unclear. Although preclinical studies demonstrated microbiota modulate the activity of immune checkpoint inhibitors and broad-spectrum antibiotics may lower their efficacy, the affect of antibiotics in patients with cancer who receive immune checkpoint inhibitors remains unclear. To evaluate the effect of antibiotic use in patients with metastatic renal cell carcinoma (mRCC) treated with checkpoint inhibitors like nivolumab, researchers retrospectively analyzed data from 80 patients with mRCC who received anti-PD-1/PD-L1 monotherapy, an anti-PD-1 antibody plus a CTLA-4 inhibitor, or a PD-L1 inhibitor plus bevacizumab and had available data on antibiotic use. Of those, 88% had clear-cell histology, 80% had a prior nephrectomy, and 21%, 57%, and 22% had favorable, intermediate, and poor-risk disease, respectively. Twenty percent of patients had received broad-spectrum antibiotics, including mostly beta-lactamases and fluoroquinolones. Results showed antibiotic use in the month prior to immunotherapy was associated with a significant reduction in progression-free survival. Median progression-free survival was 2.3 months in patients who received antibiotics vs 8.1 months in those who did not (P < .001). Investigators observed a significant difference in progression-free survival between the 2 groups irrespective of age, gender, IMDC risk groups, tumor burden, and proton pump inhibitor use. Researchers also found that overall response rate was significantly lower in patients who received antibiotics (P < .002). There was also a trend toward worse overall survival in those treated with antibiotics; however, median follow-up was insufficient to draw a meaningful conclusion. The investigators hypothesize that the negative effect of antibiotics on the efficacy of immune checkpoint inhibitors may be to the antibiotics eliminating the normal flora of the gut microenvironment. Researchers plan to enroll additional patients in this study to improve the sample size. Meanwhile, ongoing studies in patients with kidney and lung cancers are assessing the relationship between antibiotic use and clinical outcomes after immunotherapy. RELATED: Fumarate Hydratase Mutations and Renal Tumors: When Is Genetic Testing Appropriate? 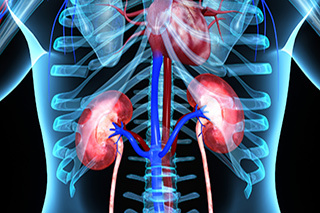 In advanced kidney cancer, antibiotic use lowers efficacy of immunotherapy [news release]. Alexandria, VA: American Society of Clinical Oncology (ASCO); February 13, 2017. Accessed February 13, 2017.